the following circuit is from the reference design you can find the details of the circuit and calculations from the document. 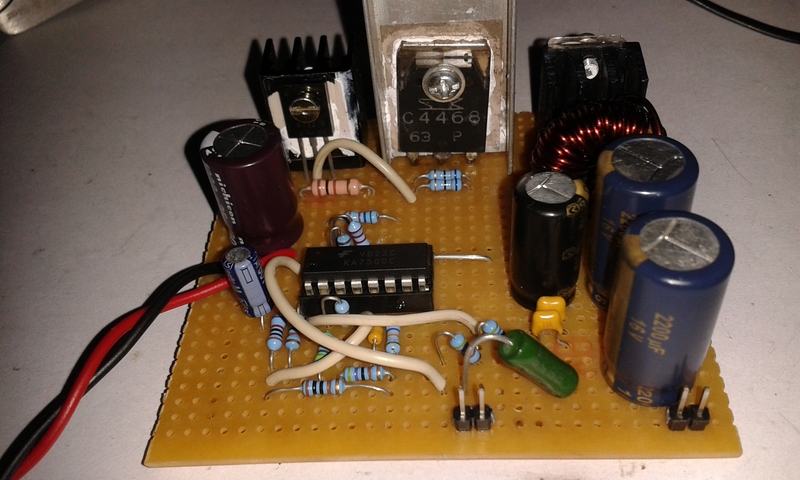 This is one of the application circuit built around with KA7500C, this buck converter can suply a load current of 5.75Ampere at 5V we could also use TL494 or KA7500c both are same in operation/ratings. The recommended operating voltage range is 7V to 40V DC and the power source i am using for this is a old laptop power supply adapter rated 18V,3.7A. , however the maximum input current the circuit draws is 2A at full load. Note: C1,C2,C3 are the low ESR electrolytic capacitors add 2 of 100nF,50V rated ceramic capacitors in parallel to C1,C2,C3, to reduce the high frequency noise. L1, FS-1RN series toroidal cores made from iron powder (26) for creating inductors, FS-1RN core or similar you can get this one from old desktop PSU’s. here is a useful link of toroids, one of my friend Mr William helped me in selecting toroidal core, thanks to him. Q1 , Q2 are2SB772 2SC4468 they are audio transistors, can be used for switching applications, linear. 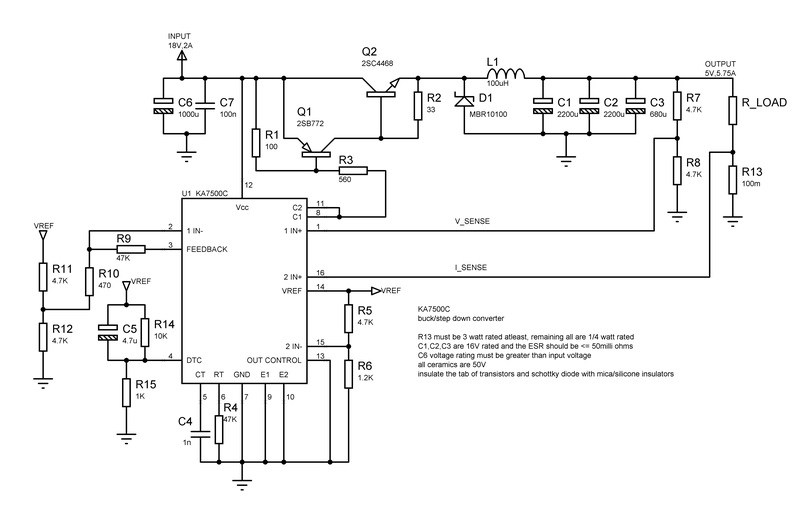 Simple buck converter and nothing fancy the Schematic is straight from the datasheet, 5V, 1A output. 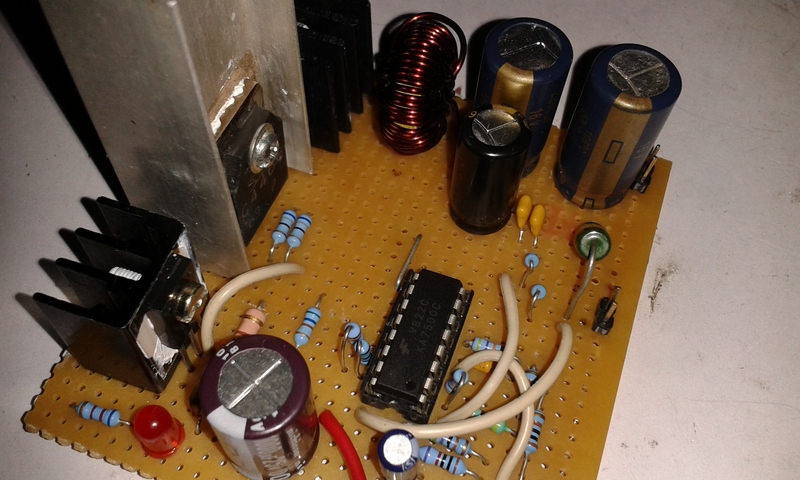 this is the small application of buck converter yeah ATtiny84 LED board.